Why are People Choosing Invisalign Orthodontics in Williamsville? The alignment of your teeth has a significant impact on various aspects of your life. Not only is a beautiful smile linked to increased confidence, but improved oral health. When the teeth are misaligned, maintaining good oral hygiene is harder. This causes an increased risk for cavities and gum disease. You may have considered braces in the past to straighten your teeth, but the restrictions and appearance have caused you hesitation. Now, you can get straight teeth with Invisalign in Williamsville. More people are turning to this orthodontic treatment due to the benefits it offers. Invisalign does not use metal wires and brackets to move the teeth. Instead, custom-made aligners are worn over the teeth to gradually move them into position. The aligners are clear, so the treatment is virtually invisible. You do not have to worry about the unsightly appearance of metal for a more sophisticated treatment. On average, it only takes about 12 months to finish your treatment—not years like that of metal braces. The aligners are created in a series and are worn for one to two weeks. You can switch to the next aligner in the series right from your own home. You do not have to go to your dentist in Williamsville for adjustments, like those needed with traditional braces. However, you will still need an appointment every couple of months to monitor the progression of the treatment. Since no metal braces are used, there is virtually no discomfort. In addition, you will not have irritation to the inside of your lips, cheeks, or tongue. The aligners are smooth and provide a custom-fit for a truly comfortable treatment. When choosing Invisalign, you will not have dietary restrictions like that of metal braces. The aligners are removable so you can eat and drink what you like. However, you should only drink water while wearing the aligners to prevent them from becoming damaged or losing their transparency. Traditional braces require you to brush and floss around wires and brackets, which is time consuming. 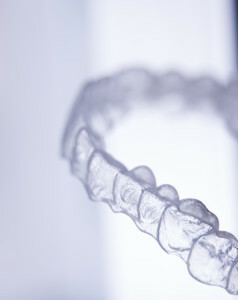 Invisalign simplifies oral hygiene during orthodontic treatment. Since the aligners are removable, you can care for your teeth just as you would if you were not undergoing treatment. Then, just clean the aligners prior to placing them back in your mouth. When used on the ideal candidate, Invisalign produces the same high-quality results as traditional braces. Although just about everyone can use this treatment, there are a few cases that may need traditional braces. You will need a consultation to determine if you are a candidate for Invisalign. If you are ready for a more sophisticated orthodontic treatment, it is time to schedule a consultation with Amherst Dental Group. We will create a customized treatment plan to give you a straight, beautiful smile using the most preferred option to traditional braces. Start your path to a straight smile with clear aligners at Amherst Dental Group. Comments Off on Why are People Choosing Invisalign Orthodontics in Williamsville?